A recent federal proposal puts a spotlight on an uncommonly popular topic: wholesale energy markets. Our new research shows that energy efficiency has provided steadily increasing value to grid operators and customers in two such markets. 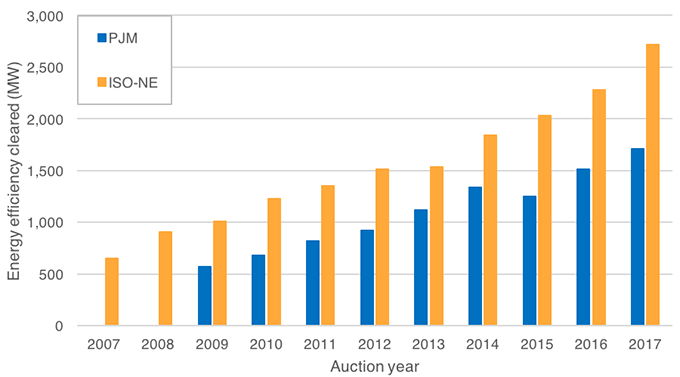 Our report, Energy Efficiency in Capacity Auctions: A Historical Review of Value, finds that since they have been included, efficiency resources have almost tripled in the Mid-Atlantic auction and almost quadrupled in a similar auction in New England. Grid operators — known as independent system operators (ISOs) or regional transmission organizations — hold auctions to procure future energy resources at the wholesale level. The grid operators for the Mid-Atlantic and New England, PJM and ISO-New England (ISO-NE), procure such resources through mandatory auctions where providers bid on selling capacity to the grid at the auction’s clearing price. Across the country, these providers are mostly electricity generation sources like natural gas or coal plants, solar farms, and hydroelectricity facilities. In the case of PJM and ISO-NE, they also include demand-side resources such as energy efficiency and demand response. We explore how the inclusion of energy efficiency in these auctions reduces system-wide prices and retail customer rates. We use an example from Baltimore Gas and Electric to look at how efficiency in capacity auctions translates directly to bill savings for residential customers. As more energy efficiency clears these auctions, its providers gain revenue and incentive to invest in additional efficiency. The figure below shows how much energy efficiency has cleared in each auction (this does not include any demand response resources). How does load forecasting fit in? These growing energy efficiency resources, as well as those not bid into the auctions (which are captured in the region’s load forecast), reliably reduce the amount of energy demanded in the PJM and ISO-NE areas. Low-cost efficiency reduces both the number of units procured in the capacity auctions and the price paid to all resources. This ultimately lowers prices for customers and can accrue to large savings across a region. One analysis showed, for example, that using energy efficiency to meet Ohio’s regulatory standards would save $1.3 billion through the year 2020. We highlight historical and current issues in how efficiency is represented (or underrepresented) in load forecasting methodologies, as well as examples of the benefits of accounting for efficiency in both the load forecast and the capacity auctions. Evaluating the effects of energy efficiency in wholesale markets is especially important right now. In September, the US Department of Energy asked the Federal Energy Regulatory Commission to create a rule to provide financial rewards for resources with long-term reserves of fuel onsite. This was intended to give an advantage to resources like coal and nuclear power in wholesale energy markets. The guidance has caused many energy market actors to evaluate the needs of the grid and how different resources might meet them. Our report highlights reasons efficiency should be expanded in these markets, rather than reduced (as might be the case if other resources receive new financial incentives), and the beneficial role that efficiency resources are increasingly playing in wholesale markets.